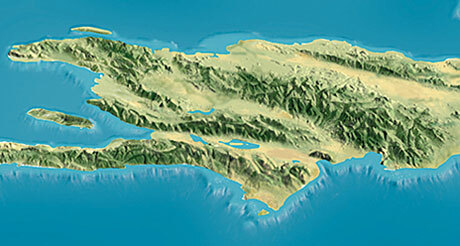 The oblique relief of the Caribbean island Hispaniola was produced using “Natural Scene Designer Pro”, and a resolution-bumped DEM. The unsatisfactory quality of the computer rendered relief required not just retouching but more extensive reworking of the image, causing Tibor G. Tóth to spend more than half of the production time on repainting the relief with the Adobe Photoshop airbrush tool. Because of the lower level data quality of the 30 pixels per degree ETOPO2 (or even CleanTOPO2), this is also true for the ocean floor relief that generally receives disproportionally more of Tóth’s attention than the land relief of any given map. “Hispaniola” (section) – oblique relief by Tibor Tóth, © National Geographic Society. The “Hispaniola” image is only a section of the “Traveler’s Map of the West Indies”. The map’s dimensions are 79 × 51 cm (31 × 20 inches). Because of the greatly distorted perspective view, there is no accurate scale available. Tóth prepared the digital relief in 2002 – the map was published as a supplement in the March 2003 issue of the National Geographic Magazine. Reliefkarte der Centralschweiz by Xaver Imfeld. Plan Oblique Europe, developed by Jonas Buddaberg, Bernhard Jenny, Johannes Liem (Oregon State University OSU).